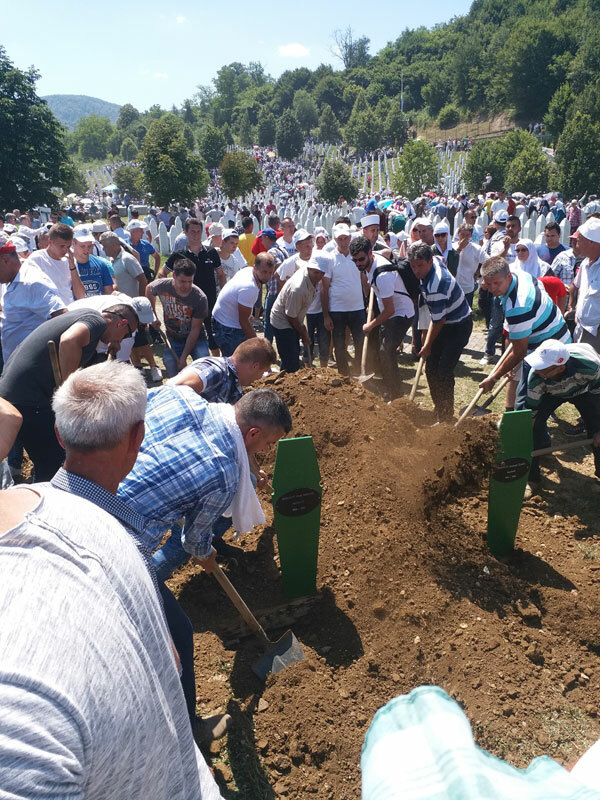 Majcic Esad has just buried his cousin. Or, as he specifies, “two small bones” belonging to his cousin, Gabeljic Dzemail, who was 23 years old when he was murdered here in 1995. Twenty-two years have passed since more than 8,000 Muslim boys and men were slaughtered in Srebrenica, rendering the sleepy Bosnian town’s name forever synonymous with genocide. The families are still burying their dead. 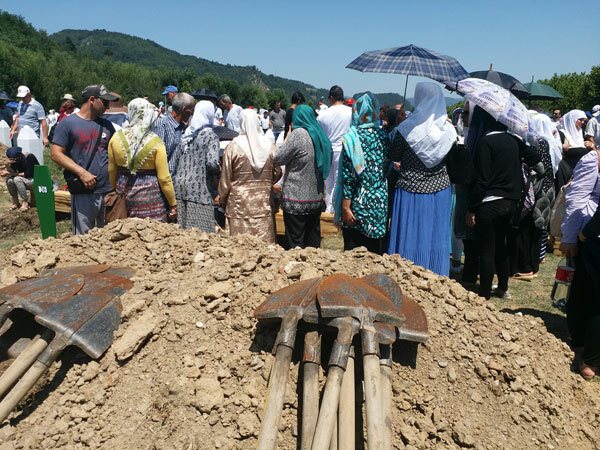 Today, Esad’s cousin and 70 other victims of ethnic cleansing were interred, yet the painstaking forensic work of digging up and identifying human remains continues. “It never ends,” says Esad, who flew in from Germany, where he now lives, for the much-belated funeral. “We’ll continue to look for the rest,” he adds, eyeing the new grave, which sits next to those of the victim’s father and brother. Along the road leading to the cemetery, venders sell ice-cream and sweets, while amputees – likely victims of the war’s legacy of landmines – beg for change. 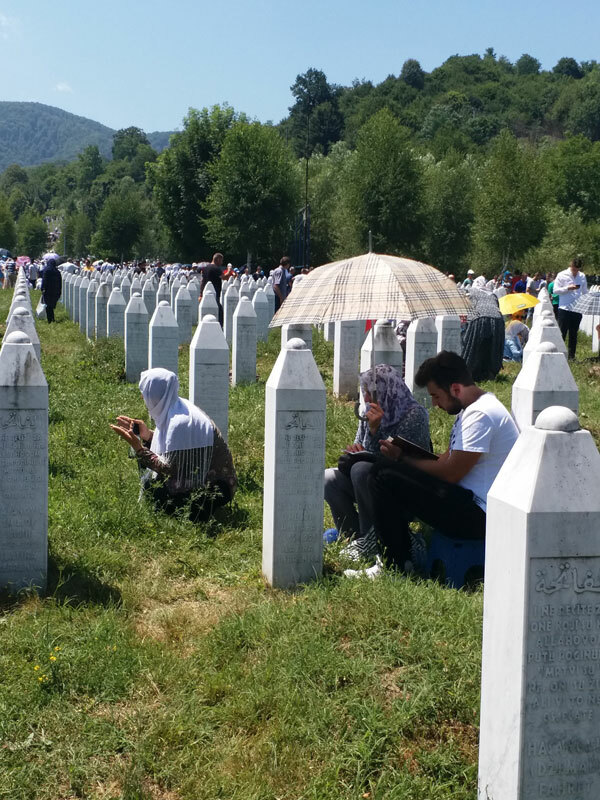 The thousands of white headstones belonging to the genocide’s dead appear blinding in Bosnia’s relentless summer sun. There are so many graves that one has to walk over them to traverse the enormous cemetery. Without these stark stone reminders, the scene as thousands of relatives gather this July 11 could almost resemble a family picnic -- a sea of colourful headscarves and umbrellas, some people clutching prayer books, others sitting on blankets, smoking, snacking. But after the politicians’ speeches and the Imam’s prayers are done, the slight green coffins of those to be interred are carried out to their freshly dug graves and the enormity is too much. Silence descends and tears flow. In a country rife with daily ironies – from the fact that you can often tell a Muslim, Serb or Croat from the cellphone company he uses (each owned by a specific ethnic group), to its ethnically divided schools and bloated tri-partite presidency -- perhaps one of the biggest incongruities is that Srebrenica now sits in the Republika Srpska. When the international community carved up Bosnia into two entities at the 1995 Dayton Peace Accords – the Muslim-Croat Federation of Bosnia and Herzegovinia and the Serb-dominated Republika Srpska – ethnically-cleansed Srebrenica fell in the latter, a strange reward, some feel, for the perpetrators of Europe’s worst genocide since the Holocaust. In this bucolic part of the country, its fields abundant with corn, fruit trees buckling under the weight of summer’s bounty of apples, pears and cherries, denial runs deep. Last year, for the first time, a Bosnian Serb was elected Srebrenica’s mayor – Mladen Grujicic, a Serb nationalist who denies the massacre was a genocide. Mayor Grujicic did not prevent the recent funeral commemorations from going ahead, but he announced he was increasing funding towards honouring the town’s Serbs who died in the conflict. Overall, more than 100,000 people died in the 1992-95 war in Bosnia, the vast majority of them Muslims. According to a study published on the website of the International Criminal Tribunal for the Former Yugoslavia, an estimated 58,000 Muslims and 7,500 Croats were killed, compared to about 19,000 Serbs. But 27-year-old Srebrenica-native Slavisa – university educated and unemployed, like so many here – agrees with the mayor’s moral equivalency. Sipping a coffee at a pavement café in the economically-depressed town, its dusty store-fronts displaying clothes reminiscent of a 1980s catalogue, the young Bosnian Serb – just five years old when the killings happened – is keen to impress upon me that he has Muslim friends. “I wasn’t born to hate anyone,” he says. However, as the conversation progresses, he voices theories that are fairly common among genocide deniers. “You have graves (at the Srebrenica cemetery), but those people are still living – in Germany or Sweden,” he claims. Many of those buried there were also military, not civilians, he says. Apart from disputing the number of dead, Slavisa insists that, while killings did occur, genocide is the wrong word. “Think of it logically: If 8,000 were killed how come they (Muslims) are here today?” he asks. Among the other opinions he espoused during our conversation: The Muslims shelled their own people in Sarajevo so they could represent the Serbs as genocidal; every year the Muslims are increasing the number they say died on their side; numbers of Serb deaths have been downplayed by the biased media; and Bill Clinton is a war criminal for the 1999 strikes against Serbia. Slavisa is part of a younger generation that doesn’t remember the war, but is still very much a product of its society. Many of the distortions he espouses are, in fact, taught in school. Last month, Republika Srpska President Milorad Dodik said that he would ban any school history books that include references to the genocide. Across the country, some educational institutions operate under the so-called “Two Schools Under One Roof” system, whereby children are divided, in the same building, into classes segregated along ethnic lines and are taught different curricula. “Here, it is impossible to use schoolbooks from the Federation in which it is written that the Serbs committed genocide and held Sarajevo under siege. It’s not true, and it will not be studied here,” Dodik told local media here in June. In fact, Slavisa’s views are pretty moderate compared to some. In Republika Srpska’s capital, Banja Luka, people had planned a rally to coincide with the Srebrenica anniversary in support of Ratko Mladic, the wartime commander of the Bosnian Serb forces now on trial for genocide and war crimes at the Hague. Initially given the green light by local authorities, the rally has now been delayed – but not cancelled – and a Banja Luka journalist who spoke out against it is in hiding after receiving death threats. Technically, Bosnia has been at peace for 22 years, but in reality, the battle continues over history, memory, and who wronged whom. It is a country where some citizens wear Ratko Mladic t-shirts and rail against The Hague, while others have waited more than 20 years for what they call some semblance of justice. Just across from the cemetery is the old UN-designated safe zone where Dutch peacekeepers turned back refugees seeking their protection, essentially handing them over to Mladic and his men for slaughter. 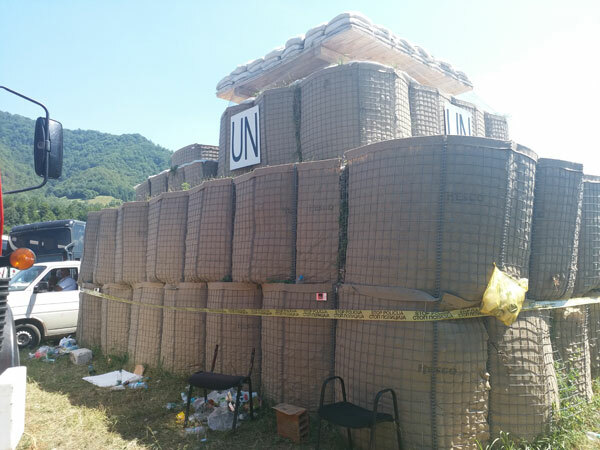 Sandbags and a UN sign remain in place 22 years later, testaments to the world body’s greatest impotency. The youngest victim buried here this year was a 15-year-old boy. His cousin, Selvedina, has returned to Srebrenica for the teenager’s interment – alongside the graves of her own father, grandfather and uncle. She now lives in Iowa, where she works at a Walmart. Selvedina and her female family members were put on buses to Bosnian Army-controlled territory. They never saw their male relatives alive again. “There is no justice here,” says Eman. On the road from Sarajevo to Srebrenica, a large sign marks Bosnia’s division: “You are now entering Republika Srpska,” it says. It has been splattered with red paint. Kate Bartlett is a Zimbabwean journalist who has worked in Cambodia and Hong Kong. She has also reported from South Africa and Afghanistan. She is currently based in Sarajevo.